Caldo Frío performs at The Kraken in Brownsville. 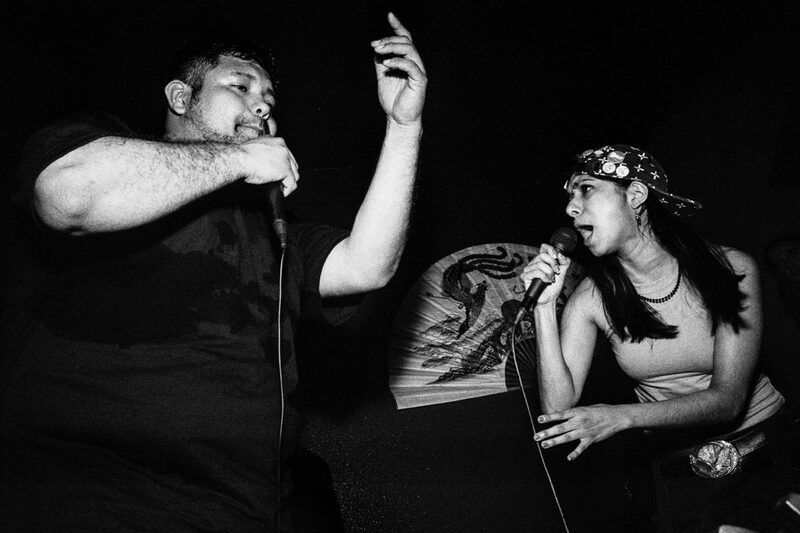 The origin of local Spanish-language rap duo Caldo Frío can be traced to a downtown McAllen dance floor. From what Jesus “Chuy” Reazola and Carmen Castillo remember, the birth of the band was backed by cumbias at Yerberia Cultura. “We were literally dancing, and I just happened to throw out there: ‘hey man, if you have anything in the works, … I’d be down to help you out,’” Castillo recalls telling Reazola. The pair said they were fans of each other’s work from their other musical projects. Before Castillo joined, Reazola crafted early Caldo Frío music for about a year. Castillo always wanted to experiment with hip hop, but said she hadn’t yet found the right creative. “It kind of caught on fire,” Reazola said. “It got a little more attention, and people started asking for more. Caldo Frío will celebrate the release of their sophomore album, “Mi Bandera,” on Saturday at Moonlight on 10th. Ghost Palace, Thr33 H3ad3d Dragon, T.A.O., C.H.K., Monstruo Bohemio (their other band) and The Violet Project are also on the bill. And returning from a four-year hiatus, Personal Use will perform as well. “Mi Bandera,” like their previous record, is on Donna emcee Sergio “Evolve” Hernandez’s label Boom Bap Masterpiece Records. Hernandez said the group’s style reminded him of Mexican hip-hop group Control Machete, which Reazola cites as his introduction into the genre. “When I was a kid, my older brother … forced me into learning the lyrics and helping him sing it,” Reazola said. The duo said the local hip-hop scene is expanding in the Rio Grande Valley, partly due to the availability of more venues. Caldo Frío plans to continue making music, performing and pushing themselves as artists. Reazola said there is room for them to grow.